I attended my first writing conference in Houston back in 2005. I prepared carefully (though in retrospect, foolishly) by printing out three or four copies of an essay I hoped to publish. I might meet an editor, I thought. That editor might ask me what I write. Surely the editor would want to publish me. And this might happen multiple times. Long-story-short, I brought every manuscript page back home with me from that conference, too wrinkled for anything but the recycling bin. In fact, I really hadn’t prepared for the conference at all. I had prepared to promote myself. That’s it. I hadn’t read the speaker bios, and I embarrassed myself badly by coming up to American Book Award winner Thomas Lynch and asking him what he wrote and how long he’d been writing. I bought a book by keynote speaker Kathleen Norris but didn’t ask her to sign it because I felt too shy. I learned later that Ms. Norris asked my friend why I hadn’t said hello when I saw her at her signing table one evening. “Is your friend unhappy with the conference,” she asked. Oh, me. I should have prepared differently. I should have gotten over myself. I should have been thinking about how I could encourage others, not about what I could get for myself. Read the speakers’ bios and highlight those writing in your genre. Find your highlighted speakers’ books in your local library or use the “Look Inside” feature on Amazon to flip through and get a feel for the work. Slide some of your grocery money into a side pocket to spend at the event (save $1 or $2 a day or more in the month before the conference). As you select your workshops, don’t use a Sharpie to mark them—use pencil. And circle at least one option that’s outside your normal interests (you can always sit in the back and slip out early if it’s not a good fit). If you’re the sort of person who has anxiety when facing new situations and the conference is local, drop by the venue and scope it out. Knowing the lay of the land in advance will decrease your anxiety as the event date draws near. Business cards if you have them (but leave your manuscript at home). Use those cards as an easy way to keep in touch with fellow writers you meet at the event. An attitude of generosity. Bring a cup of coffee to the speaker of your morning workshop. Buy books and bless the bookstore and authors (and yourself). If you do meet an agent or publisher or author in the hallway, just chat. Don’t pitch your book (that can come later, via email). On the day of the event, ask not what the writing community can do for you but what you can do for the writing community! Chat with fellow writers about their work. Offer feedback and encouragement. Find out how what other writers are doing for support and ask how you can help. Jot down names, events, book titles, and ideas. The fruit of any literary event is only partly made up of the stuff listed in the program. Making new literary friends and hearing what’s going on in the community is a huge benefit that will only come your way as you reach out and shake hands and listen. The fledgling writer who sits beside you at the morning keynote may publish before you do and help you make connections to their agent or publishing house years in the future. But don’t think about that now. Think about how you can put someone else at ease. Come to literary gatherings with the goal of giving. Whether you feel like it or not, you’re a member of a literary community. Be generous and do your homework. The blessings will come back to you. You’ll see. Thank you so much for all of the registrations, which have been pouring in over the last few weeks. For the first time in our festival’s ten-year history, we have met our legal capacity for the venue and are now sold out. If your registration is in the mail, we will be putting you on a wait list and will contact you as space becomes available. If you are already registered but won’t be able to attend after all, please let us know via Facebook message or email to lisaw@linfield.edu. Our desire is to make the program available to as many people as possible. We have something special for you to commemorate the 10th anniversary of the Terroir Creative Writing Festival, happening all-day, April 20 in McMinnville. 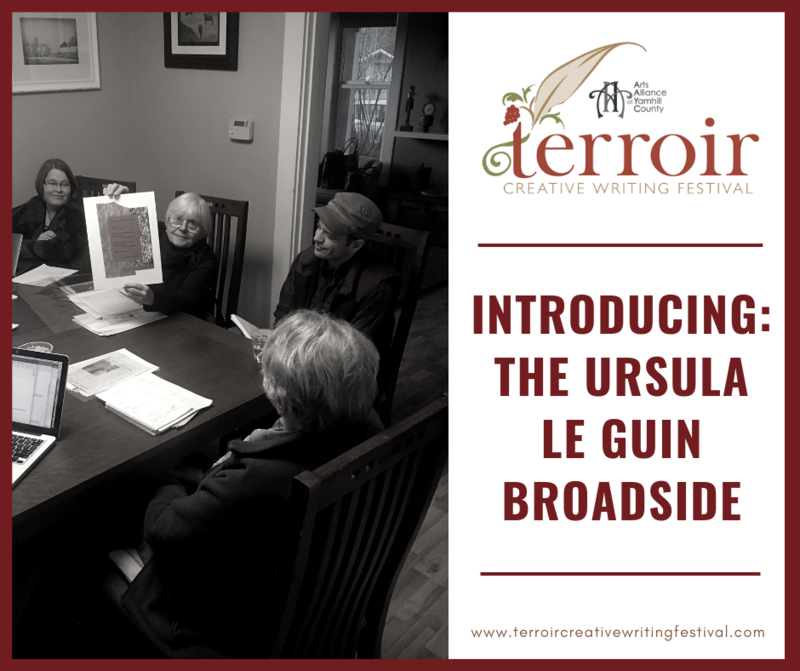 The festival committee commissioned a broadside featuring a poem by the late Ursula Le Guin, a keynote speaker from our first festival. What exactly is a broadside? Broadsides are created on the highest-quality paper, and the text is generally executed on letterpress and embossed. “This one is special not only because it is a poem by Ursula Le Guin, but because an artist has created the setting for it that makes it a piece of art,” Setziol-Phillips said. Commissioning the broadside involved committee members Barbara Drake, Lisa Weidman, and Setziol-Phillips. The members worked with the Le Guin family to find an appropriate poem, secure a grant from the Yamhill County Cultural Coalition, and engaged artist Margot Voorhies Thompson to execute the artwork. The committee received permission rights for the final poem selection, “Slick Rock Creek,” from the LeGuin family and LeGuin’s publisher, Houghton, Mifflin, Harcourt. Proceeds from the sales will go to support the annual writing festival. Are you signed up yet? Time is marching on! Sign up today to secure your spot! 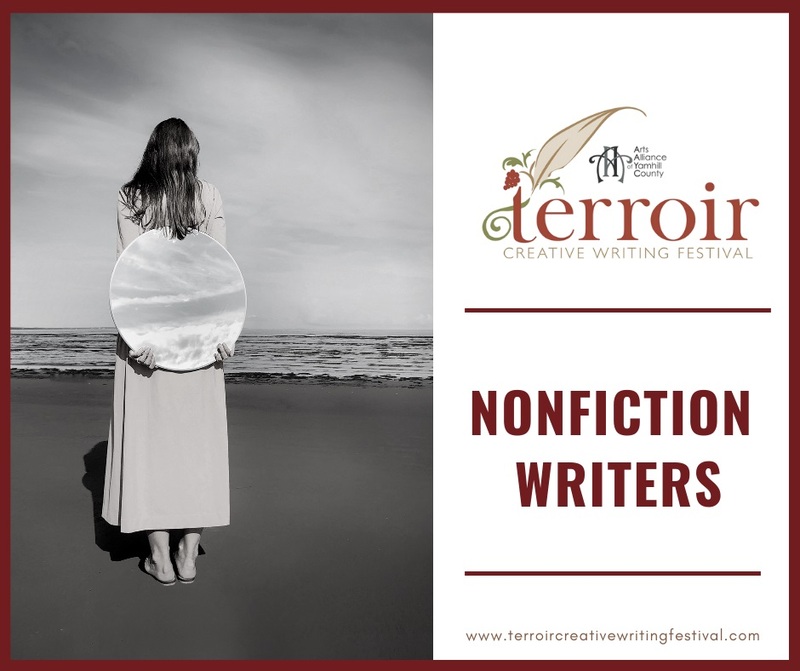 We have two fantastic nonfiction writers speaking at the Terroir Creative Writing Festival this year, bringing a mix of humor and meaning, fun and reflection, history and place. The world outside becomes a jumping off point for personal reflection for these two accomplished writers. Come join us! Have you signed up for Terroir yet? It’s happening April 20 in McMinnville. Register here today! If finding truth in a world of your own creation is your jam, you’ll find much to celebrate at this year’s Terroir, happening Saturday, April 20 in McMinnville. We have a roster of fiction writers across genres who are coming to share their wisdom about world-building, observing real life, the necessity of realistic fiction, and the depths of magical realism. Here are the writers who will be speaking on the craft of fiction writing or reading from their own works. Are you excited yet? Register today! For our 10th anniversary event, happening all-day April 20 in McMinnville, we are revisiting the idea behind Terroir. Whether or not you can pronounce this word, thrown around by wine aficionados and cheesemongers alike, terroir very much affects your writing. The terroir of your creative practice gives tone to your writing as earth gives particular notes to a fine wine. Writing for happiness, then—the mysterious “hap” of your story—is a matter of paying attention to your place, your moment, and your calling. In the beginning, creatures said to writers, “Tell our story.” We do this by writing earth verse, for spells, charms, poems, psalms and songs have long provided solace, clarity, and a chance to make peace with ourselves, each other, and Earth. Through poems, trees teach, and rivers guide. OREGON POET LAUREATE KIM STAFFORD is the author of a dozen books of poetry and prose, and editor of half a dozen others. His book Having Everything Right: Essays of Place won a citation for excellence from the Western States Book Awards in 1986. Stafford has received creative writing fellowships from the National Endowment for the Arts, a Governor’s Arts Award, and the Stewart Holbrook Award from Literary Arts for his contributions to Oregon’s literary culture. What stories grow from the soil you live—and how can you discover them? In this workshop we will follow the trail left by writers whose work has explored “a sense of place” in order to nurture the seeds of the your own stories. BETTE LYNCH HUSTED lives in Pendleton; the characters in her novel All Coyote’s Children live on the nearby Umatilla Indian Reservation. A sense of place inspired her poetry collection At This Distance and two memoirs, Lessons from the Borderlands and Above the Clearwater: Living on Stolen Land (an Oregon Book Award finalist). Registration for the 2019 festival is OPEN! 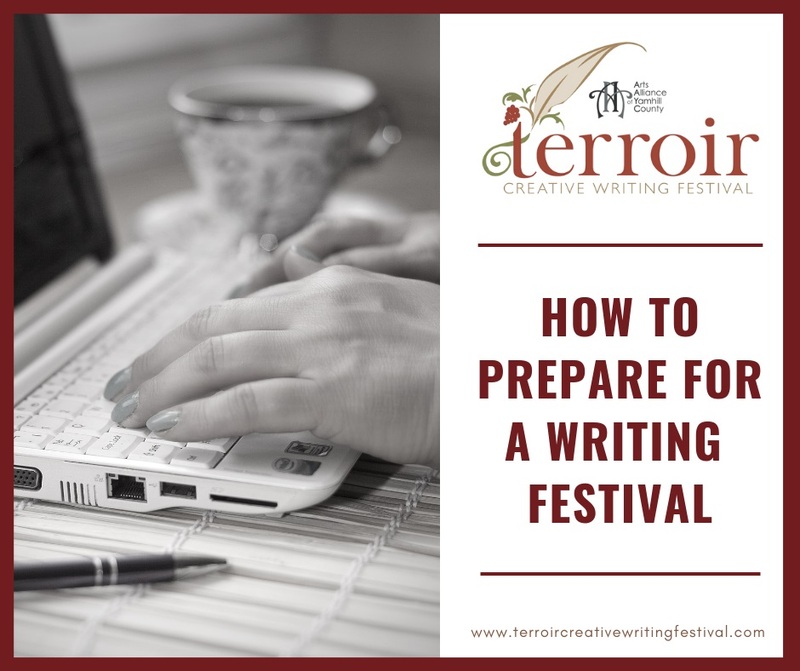 Ready to grow your writing? Our registration for the 2019 festival is now open! Head on over to the AAYC website here to register online. Print out this 2019_TCWF REGISTRATION FORM.